Yesterday, a rumor suggested that HTC is going to introduce the rumored Nexus tablet on October 9th, which means the purported tablet may in its final stages of production. Previous rumors hinted the tablet will be codenamed Flounder or Volantis. 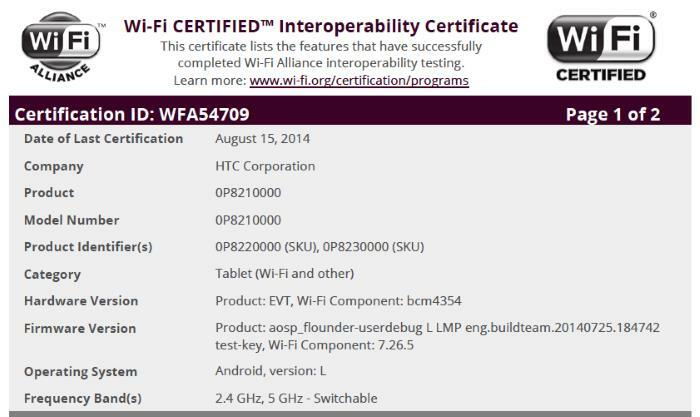 Recently, an alleged HTC tablet was spotted on the WiFi Alliance, which mentioned the tablet is from “HTC Corporation, and runs AOSP Android L as its operating system. The listing also mentions “Flounder” in the firmware, adding more weight to the already spread rumors that HTC is working on a Nexus tablet, in collaboration with Google. Additionally, the listing also mentioned some product identifiers such as “0P8210000, 0P8220000, and 0P8230000” which we’ve spotted in previous leaks as well. The alleged Nexus tablet is said to come with an 8.9-inch display sporting a resolution of 2560 x 1600 pixels, a 64-Bit Tegra K1 processor, 16/32GB storage on board, an 8MP camera with OIS and should come with Android L as its operating system out of the box. There’s no official word from Google or HTC about its existence, but it seems it won’t take too much time for the tablet to get official, since it’s being certified by regulatory bodies. We’ll update you as soon as more information comes up.